CHARLESTON S.C. (Reuters) - A deep-ocean exploration company is seeking to recover a lucrative haul of gold aboard the shipwreck of the SS Central America, nearly 160 years after it sank off the coast of South Carolina in a hurricane. The work that began this week follows a long court battle over treasure salvaged from the shipwreck in the late 1980s by a pioneering young engineer whose efforts were detailed in a 1998 bestselling book, "Ship of Gold in the Deep Blue Sea." The 280-foot (85 meters) sidewheel steamship carried as much as 21 tons of gold ingots, freshly minted gold coins and raw gold from the California mines, as well as the personal wealth and belongings of its 477 passengers, most of whom were lost when the ship sank in September 1857. The ship's gold that is thought to remain on the ocean floor was valued at $760,000 in 1857 but worth millions today, according to Odyssey Marine Exploration Inc, a Tampa, Florida-based company, which won the contract to revisit the shipwreck. "There's no doubt in our minds that there's going to be an economic return," Mark Gordon, the company's president and chief operating officer, said on Monday. Gold recovered from the ship by a team led by Ohio engineer Tommy Thompson, which discovered the Central America using sonar and robotic technology he developed, became the focus of an extended legal fight over rights to the treasure and return for investors. Thompson has been a fugitive since 2012 when he failed to appear in court. Last year, a court in Ohio appointed a receiver who will distribute some of the profits from further exploration to the former investors. 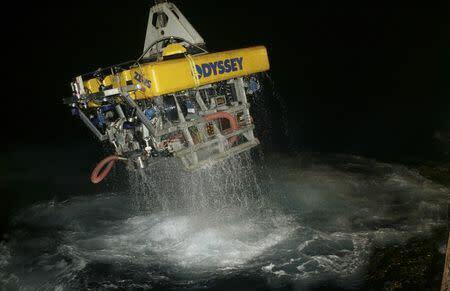 In March, the receiver awarded Odyssey the contract to revisit the shipwreck, which lies 160 miles (257.5 kilometers) offshore and about 7,200 feet (2.2 kilometers) below the surface. "We know that the wreck was only partially excavated, only about 5 percent of the site," Gordon said. The company's research vessel, Odyssey Explorer, sailed from Charleston, South Carolina, last week with 41 crew members for a project he estimated will cost between $5 million and $10 million. The Central America steamship ran between Panama and New York, carrying prospectors and their fortunes made in the California Gold Rush. On its last trip, it held tons of commercial gold valued at about $93,000 in 1857 and passenger gold valued at up to $1.2 million, court experts estimated. Historians say the ship's sinking triggered a New York banking panic that was part of a larger U.S. financial crisis known as the Panic of 1857. 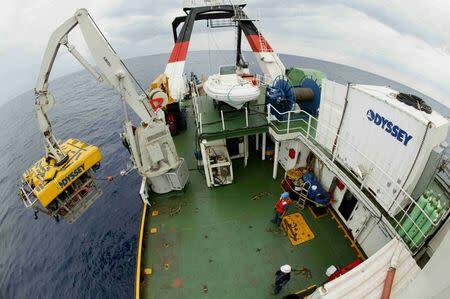 The worth of the gold found by the Odyssey team will depend on what form they find it in, Gordon said. For example, U.S. $20 Double Eagle gold coins fetch $5,000 apiece on average from collectors, he said. The market price for pure gold bullion on Wednesday was around $1,300 per troy ounce. Researchers will remain on site for up to five months, rotating crew around the clock and making occasional port calls on Charleston, Gordon said. The company expects to report in about 60 days what the wreck might yield.